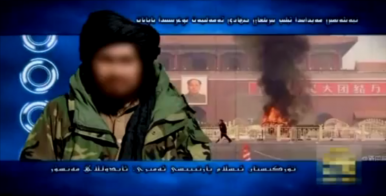 In a new CCTV documentary, China highlights the dangers of online terrorist propaganda videos. On Friday, China officially expanded its crackdown on terrorist activities into a new battlefield: cyberspace. Tuesday, CCTV released a 24-minute documentary on the connection between online terrorist propaganda and training videos and terrorist attacks within China. According to Xinhua, the documentary was made in cooperation with China’s State Internet Information Office, Ministry of Public Security, and State Council Information Office. Below is the original, Chinese-language CCTV documentary. The second video provides a brief synopsis with an English voiceover. The video includes footage from a number of terrorist attacks within China, including attacks in Tiananmen Square, Kunming, and Urumqi. It also includes extensive footage from videos posted online by the East Turkestan Islamic Movement (ETIM), the major focus of the documentary. The videos show black-clad men firing weapons or doing exercises as well as shouting slogans. Several of the videos include ETIM members talking while footage of attacks in China play behind them. There are also videos that give tutorials on how to fire guns and build explosives. The documentary draws a direct connection between these online materials and terrorism in China. It says that every one of the terrorist attacks in China has been related to video and audio propaganda found online. The documentary includes interviews in which accused terrorists talk about how they gathered with others to watch the videos and grew more and more passionate about jihad. The documentary also notes an extreme jump in the number of videos posted online by ETIM (from eight in 2010 to 109 in 2013). The rise in online material correlates with a jump in the number of actual attacks carried out in China. The documentary makes it clear that the online spread of terrorist propaganda is a major factor in the rise of extremism and violence in China. The release of the documentary was accompanied by a media push in Xinhua. A commentary called online videos and audio a “cordial that speeds up the growth of the cancer” of terrorism. The commentary emphasized that such videos not only spread the ideology of jihad and promote terrorist attacks, but actually give viewers the necessary knowledge and skills for carrying out an attack. The piece notes that similar materials have incited terrorist attacks around the world, such as the bombing at the Boston Marathon in 2013. The commentary strongly defended China’s campaign against terrorist propaganda. “Among those who advocate absolute freedom of the Internet, there are concerns that the Chinese government’s campaign to rid cyberspace of terrorist content could harm people’s personal rights. But they are wrong,” the article said. It also pointed out that China was seeking international cooperation in removing terrorist materials from the internet. China “needs support and cooperation rather than doubt or criticism,” it said. The documentary also emphasized the international nature of the problem, noting that much of the terrorist propaganda is located on servers outside of China. Several shots in the video made it clear that both YouTube and Google host such materials. Under these circumstances, the Chinese government cannot do anything to remove the videos at their source, but can only try to block domestic internet users from accessing the sites. Thus technologies that allow people to bypass the Great Firewall present a direct threat to Chinese security. As Xinjiang’s Party chief said earlier this year, “90 percent of terrorism in Xinjiang comes from jumping the wall.” Taken along with China’s recent emphasis on “Internet sovereignty,” the anti-terrorism crackdown provides a strong argument for closer control of the internet. To emphasize the need for international cooperation, the documentary highlighted ETIM’s ties to international terrorist networks around the world. It noted the similarity between ETIM propaganda videos and those released by other groups. The documentary also stressed that ETIM operates out of the border regions of Afghanistan and Pakistan, where its members interact with al-Qaeda and the Taliban. The video underlined that terrorism is not a Chinese problem, but a global problem that requires an international response. Part of that response, Beijing hopes, will be more cooperation to weed out terrorist safe havens in cyberspace.